Box art for Donkey Kong Jr.
Donkey Kong Jr. is a Game & Watch edition of Donkey Kong Jr. As in the original arcade game, Donkey Kong is captured by Mario, and Donkey Kong Jr. must save him. There are two major revisions—the original version in the New Wide Screen series (released on October 26, 1982), and the colorized game in the Table Top and Panorama Screen series (released on April 23, 1983, and October 7, 1983, respectively) with an entirely different level and obstacle layout. It was the first game in the New Wide Screen series. Only the New Wide Screen version was ported to Game & Watch Gallery 3, Game & Watch Gallery 4, and DSiWare. It is also found in the Museum in Game & Watch Gallery 2. The game also has an indirect sequel in the form of Donkey Kong II. The alarm indicator for the New Wide Screen version is Mario, who is located under Donkey Kong and strikes a bell with a drumstick when the alarm goes off. In the Table Top and Panorama Screen version, Mario is the alarm indicator once again, but this time he is located under the miss counter and above Donkey Kong, and he whistles musical notes when the alarm goes off. Donkey Kong Jr. starts at the bottom of the screen, where he is immediately bombarded by Nitpickers and Snapjaws. After Donkey Kong Jr. climbs a pair of vines to the second floor, a piece of fruit can be found, which can be dropped on enemies below for bonus points (three for a Snapjaw on the second floor, six for a Nitpicker, and nine for a Snapjaw on the first floor). After avoiding more Snapjaws, Donkey Kong Jr. must jump to the swinging key above, which he can use to unlock part of his father's cage. The sooner Donkey Kong Jr. does this, the more points he earns (from 5 to 20). He will then drop down, repeating the process. Once four keys are delivered, Donkey Kong is free, awarding 20 points to the player. Along the way, Donkey Kong Jr. can also grab hold of vines above, which help in avoiding the ground-bound Snapjaws. Every time Donkey Kong Jr. jumps over a Snapjaw without holding onto a vine or jumps down from a vine after a Snapjaw passes, he receives a point. As the player progresses in the game, more enemies will appear, and they will eventually move faster. If an enemy hits Donkey Kong Jr., if he jumps and misses the key, or if he falls off the left side on the second floor, he loses a life. If Donkey Kong Jr. reaches 300 points without any misses, the points will be worth double until he does get a miss. If he has any misses at said score, every miss will be cleared instead. When he loses three lives, the game is over. 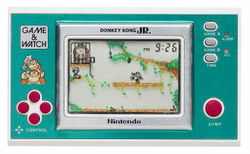 The Table Top version of Donkey Kong Jr.
Donkey Kong Jr. has to navigate his way between the key and Donkey Kong through a different layout from the New Wide Screen version. From the key, he has to make his way through some trees by using vines to get to different branches. Nitpickers and Snapjaws will appear in this section. Afterwards, Donkey Kong Jr. needs to grab the bottoms of umbrellas (which are on the left and descending) and balloons (which are on the right and ascending), being careful to fall into a pool of water. He must insert the key into the lock on Donkey Kong's chains, but Donkey Kong is waving his chain, and one wrong move can cause the key to fall into the water. Donkey Kong Jr. must go back to the key, and the process resets. Once all the chains are unlocked, Donkey Kong is freed from Mario and the game resets. 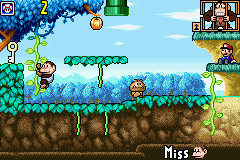 The version in the Game & Watch Gallery series of games has similar controls, although the enemies are different, including Goombas, Nipper Plants, Bullet Bills, and Spinies. Unlike in the Classic version, Mario throws the key at the beginning of each stage. Also, if Donkey Kong Jr. takes too long to free his dad after getting the last key, Donkey Kong Jr. will receive fewer than 20 points. Donkey Kong Jr. can stomp Goombas and Bullet Bills to destroy them, earning a point for each defeat in the process. In this version, Donkey Kong Jr. earns five points for dropping a fruit on an enemy. The stage also alters its appearance each time the player successfully releases Donkey Kong. The game starts with a jungle ground-level setting. When Donkey Kong Jr. gets the key here, a Rotary Lift appears to the left of the cage. The next stage features the treetops during sunset. An Albatross appears to the right of the cage when Donkey Kong Jr. gets the key floating in the air here. The final stage is a clouded area at night. Here, two Cloud Blocks appear to the left of the cage when Donkey Kong Jr. gets the key. If he jumps onto a spinning Rotary Lift, a disappearing Albatross, or fluffing Cloud Blocks, he will fall to the second floor (or a small safety platform in the second stage). This version also has bottomless pits in the second and third stages, and if Donkey Kong Jr. falls into one, he will lose a life. When Donkey Kong Jr. amasses 200, 500, and 700 points, a Heart will appear for him to remove a miss. Music is also featured in this version, with the tempo changing depending on the speed of the game. When the player goes to a different stage, the music changes. In Game & Watch Gallery 4, selecting the game yet waiting to actually start it will result in a humorous sequence being played. In particular, Donkey Kong Jr., while strolling, notices a fruit in a tree and attempts to jump up to grab it, but to no avail. Mario then arrives and grabs the fruit. Just at that moment, however, Donkey Kong arrives, causing Mario to flee, only to presumably crash into something. Donkey Kong then leaves off-screen, only to come back and reveal that he somehow got Mario locked in a cage and dragged it with him before posing. In the Super Smash Bros. series, Mr. Game & Watch has a move where he swings a key in a near-identical fashion to Donkey Kong Jr. Artwork of Donkey Kong Jr. 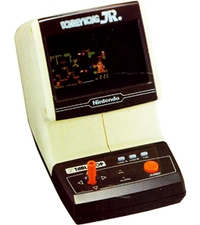 The DSiWare version of Donkey Kong Jr. When the player plays the Modern version of Donkey Kong Jr. in Star Mode, all Goombas are replaced with Spinies, regardless of the score. This is similar to how the new quest mode of Super Mario Bros. replaced Goombas with Buzzy Beetles. Donkey Kong Jr. info page on In the Attic, a website dedicated to classic videogames. In the Attic info page for a 1983 "tabletop" version of Donkey Kong Jr. In the Attic info page for another 1983 version of Donkey Kong Jr., with different controls. This page was last edited on April 21, 2019, at 21:57.